Today's Millennials--well-educated, tech savvy, underemployed twenty-somethings--are at risk of becoming the first generation in American history to have a lower standard of living than their parents. Meantime, more than 10,000 Baby Boomers are retiring every single day, most of them not as well prepared financially as they'd hoped. This graying of our population has helped polarize our politics, put stresses on our social safety net, and presented our elected leaders with a daunting challenge: How to keep faith with the old without bankrupting the young and starving the future. Every aspect of our demography is being fundamentally transformed. By mid-century, the population of the United States will be majority non-white and our median age will edge above 40--both unprecedented milestones. But other rapidly-aging economic powers like China, Germany, and Japan will have populations that are much older. With our heavy immigration flows, the US is poised to remain relatively young. If we can get our spending priorities and generational equities in order, we can keep our economy second to none. But doing so means we have to rebalance the social compact that binds young and old. In tomorrow's world, yesterday's math will not add up. Drawing on Pew Research Center's extensive archive of public opinion surveys and demographic data, The Next America is a rich portrait of where we are as a nation and where we're headed--toward a future marked by the most striking social, racial, and economic shifts the country has seen in a century. 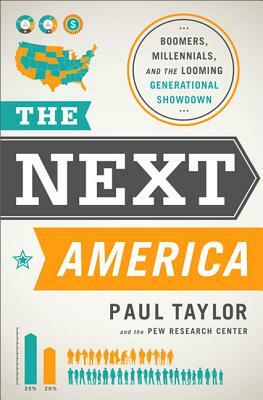 Paul Taylor is a Senior Fellow at the Pew Research Center, where he oversees demographic, social, and generational research. He is the author of See How They Run and coauthor of The Old News Versus the New News. He is a former reporter with the Washington Post, where he covered presidential politics and served as a foreign correspondent. He and his wife live in Bethesda, Maryland.